In Honor of Divine Mercy Sunday this weekend, our highlighted piece is a Divine Mercy Chaplet. The blue stones are Howlite and the red stones are wire wrapped Red Coral. 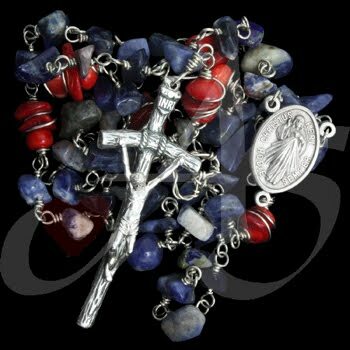 The centerpiece of this Chaplet is the Divine Mercy of Jesus. This piece is currently for sale. If you would like this piece, a similar piece, or any piece of jewelry; contact us! These earrings here are a new piece, just finished a week, or so, ago. Along the top are sterling silver balled-saucers. In the center are Chinese crystal balls and along the bottom are Swarovski crystals set into a large roundel. These earrings are currently for sale. Today’s piece is a little different than what we have been highlighting recently. This is a beverage charm set. 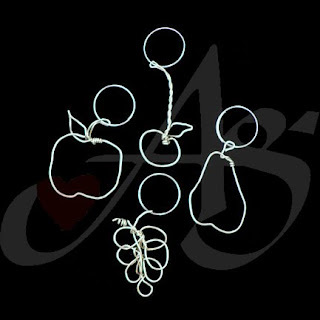 These can be used on mugs, wine glasses, or we attach them to rubber bands and use them on our drinking glasses. The set in the image below has a fruit theme. Going clockwise, there is an apple, cherry, pear, and grapes. This piece is currently available. Beverage charms can be personalized for family names or with your business logo – stay tuned tomorrow for a family set! Today’s piece is a versatile pair of earrings. These earrings are hand-twisted and hand-formed wire with a lapis tube hanging from the center of the triangle. 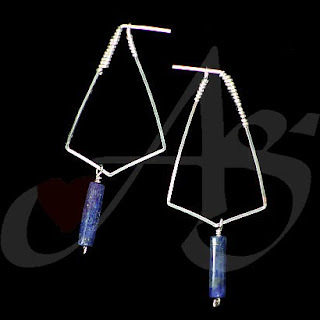 These earrings are posts, rather than the popular fish-hook style. This piece is currently for sale! If you would like this piece, a similar or a unique piece of jewelry; contact us! Today’s Earrings are a nice pair of amethyst in celebration of the wonderful spring we are experiencing. 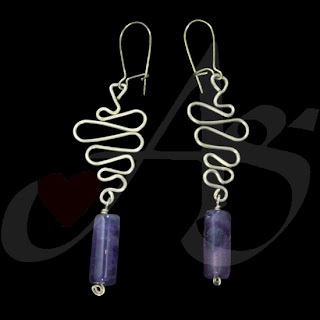 The stone hanging from the hand-twisted square brass wire is an amethyst tube. At times in our life, schedules seem to take us on a goose chase – but on the end it is our royal King who keeps us anchored. This piece is currently available. If you would like this piece, a similar piece, or any unique piece of jewelry, contact us! Agape Gifts is wishing everyone a Happy Easter, and not to forget what it really represents; Our Lord dying for you and me so that we may enter His everlasting Heavenly Kingdom. May God Bless you and your family, and we look forward to seeing you on Monday! Today’s piece was selected for its representation. This necklace is a representation of the Pieta, when Mary was holding Jesus after he was crucified. On the center medallion, the white stone is the Virgin Mary, and the longer clear glass piece is Jesus Christ. 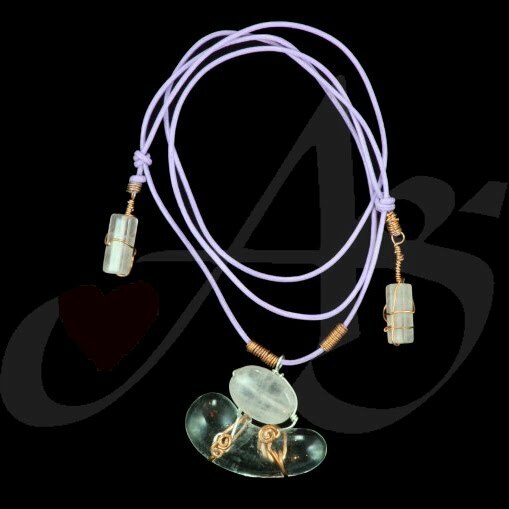 The pendant is strung on purple leather which is adjustable. This piece is currently for sale! 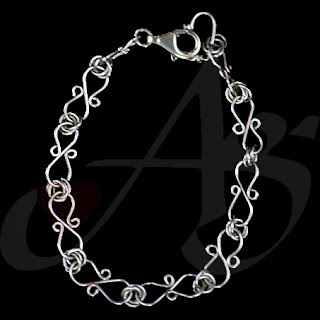 Today’s Bracelet is unique is that it one of its major components is steel. Made only with wire, the bracelet is copper and steel. The steel parts are “figure 8” connecting copper circles. Even though it is made with steel, this bracelet is rather not heavy. If you would like a similar piece, or a unique piece of jewelry; contact us! Today’s highlighted piece is an ankle bracelet. This ankle bracelet is made with glass beads. The white bricks are a US glass – made right here in the United States! The frosted white and blue seed beads are small glass beads which allow the bracelet to flow around your ankle. This piece is great for Easter with its pastel colors. It is currently available. Spring is here!! 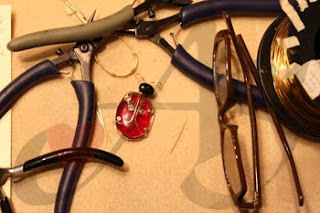 Or at least that is the only way we can explain the lady-bug on our design table. This is a work in progress, a wonderfully hand-wrapped stone. The wire used here is square brass 21g. The body-stone is dyed red glass gem. The top stone is a black agate with some fun markings. This piece is a special commissioned piece. When it is finished it will be a pin. If you would like a similar piece, or any unique piece of jewelry; contact us! Today’s piece is a dainty pair of earrings. The center square is a dyed shell. 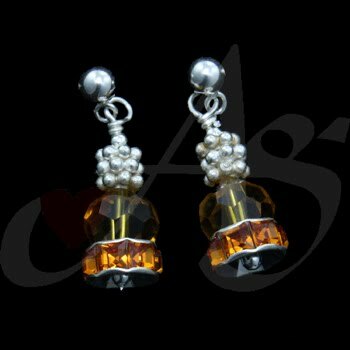 Hanging from the shell are a.999 pure silver (99.9% silver) diamond and circle. The diamond and circle are handmade along with all the wire work. These earrings are currently for sale. Today’s bracelet is a fun piece to wear. 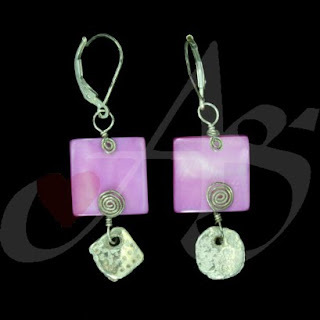 Each of the five colored squares are made from a polymer and wrapped with sterling silver wire. In between each of the colorful squares are four gold-colored Swarovski crystals. All the other metal other than the squares around the polymer is gold-filled 14/20 (14-karat) wire. This piece is currently available. 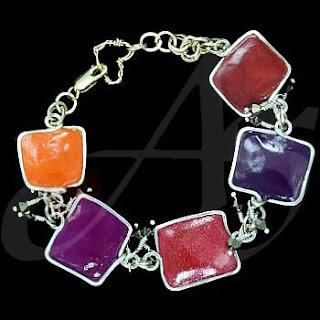 It’s a colorful bracelet and great for Easter! Today’s bracelet is hand-twisted and hand-made. It is made with gold-filled 14/20 (14-karat) wire. Gold filled wire is less expensive than gold wire because gold filled wire is made with a sterling silver core, and 2/3 of the wire thickness is then gold. The gold coating is baked on the silver core and will not rub or flake off. This piece is currently available! Today’s bracelet is an intricate set of pearls and hematite. Around the perimeter of the bracelet are pearls and clear quartz stones. Through the center of the bracelet are hematite blocks. 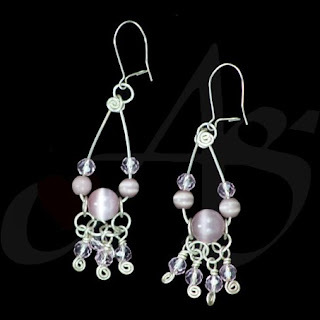 The pearls used are real cultured pearls. With the pearls and hematite, the bracelet has a little weight, but that is a reminder to show it off! This bracelet is currently available. If you would like this bracelet, a similar bracelet, or any unique piece of jewelry; contact us! 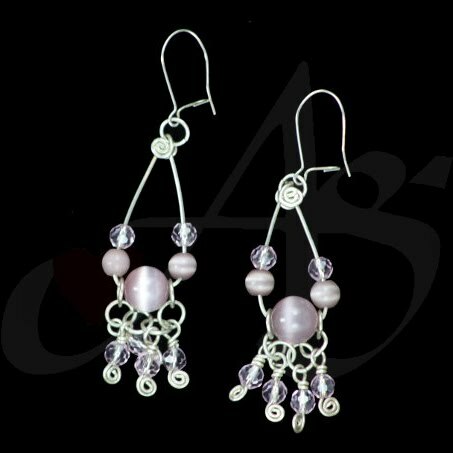 Today’s highlighted piece is an intricate pair of earrings. The earrings are made of pink fiberglass cats-eye beads and light pink Japanese crystals. All the wire work on the earrings is handmade and hand-curled. If you would like a similar pair of earrings, or any unique piece of jewelry, contact us! Today’s Confirmation Rosary is not like a regular rosary. 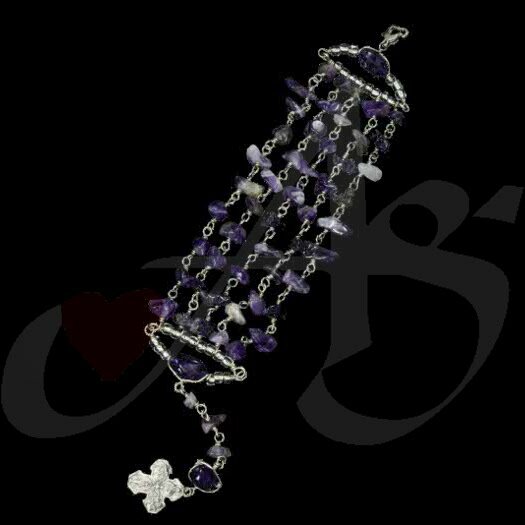 This is a full-size Rosary Bracelet. 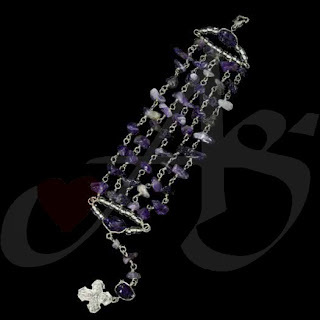 This bracelet is made with purple amethyst nuggets. 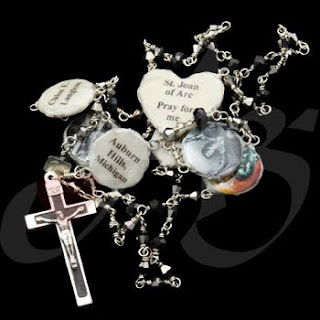 As with our rosaries – this bracelet is made unbreakable, to the best of our ability. Unlike our Confirmation Rosaries, this does not have any type of memoriam, unless you want different stone colors. 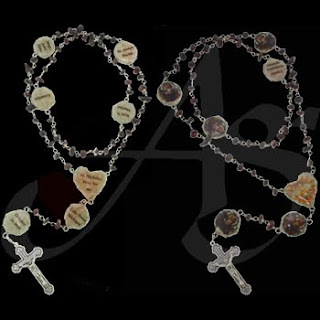 If you would like a similar Rosary, Confirmation Rosary, Special Rosary, or any unique piece of jewelry, contact us! Here is another Confirmation Rosary. This is made with metallic gray Japanese crystals and black Japenese crystals. This is made with an intercession to Joan of Arc. As with all Rosaries, this is made unbreakable. The memorial medallions are: City of Confirmation; Parish of Confirmation; Date of Confirmation; Bishop/Monsignor of Confirmation; Patron Saint; Confirmation Sponsor. If you would like a Confirmation Rosary, a Special Rosary, or any unique piece of jewelry, contact us! Today’s piece is another Confirmation Rosary. It is made with garnet chips and in the intercession of St. Nicholas. This Rosary is made with Agape Gift’s trademark of being unbreakable and has the special memorial “Our Father” saucers. These saucers have an image on one side, and on the other side are: Date of Confirmation; City/State of Confirmation; Parish of Confirmation; Confirmation Sponsor; Confirmandi Name; Bishop/Monsignor Presiding at Confirmation. This piece, however also has a longer story with it. Check it out here: (part 1), (part 2), (part 3). This week we will be looking at Confirmation Rosaries. These rosaries are more intricate than the First Communion Rosary, but still just as special. 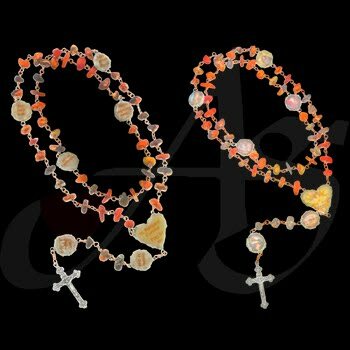 This Confirmation Rosary was made in memoriam of the St. Margaret Cortona. On one side of each of the “Our Father” saucers is an image of St. Margaret, and on the other side is the Bishop/Monsignor, Date, City, Sponsor, Parish, and Confirmandi. If you would like to order a Commemorative or Special Rosary or any piece of jewelry; contact us! Just a reminder, this blog highlights only one special piece each day. If you would like to browse our catalog on our website feel free to visit www.agapegifts.org - we'll be looking for you! 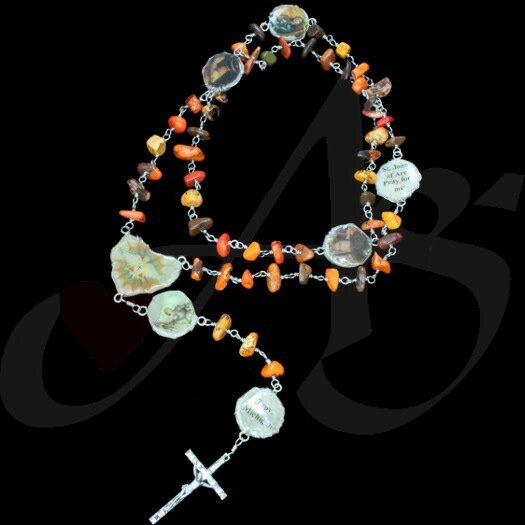 Today’s piece is a commemorative Confirmation Rosary. This Rosary is made with the intercession of St. Joan of Arc. On one side of all the “Our Father” Beads is an image of Joan of Arc, and on the opposite sides are: The Parish, Bishop (or Monsignor), Sponsor, Patron Saint, City/State, and the Confirmandi. If you would like to purchase a Special Rosary, or a unique piece of jewelry, contact us! 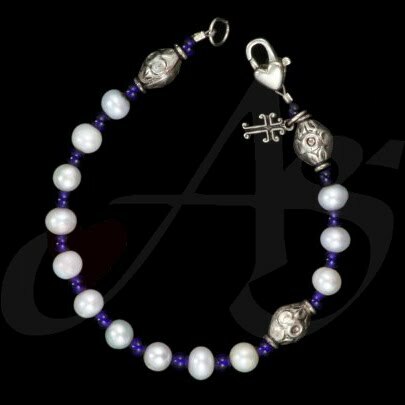 Today’s bracelet is a rosary bracelet that can be used as a first communion gift. Rather than a traditional rosary, you can give a rosary bracelet. This bracelet is similar to a previous idea, but this one is for sale! If you would like this piece, a similar piece, a commemorative Rosary, or a unique piece of jewelry, contact us!